Our skills are finally in demand. As gently as you can. —from "The People on the Bus"
In Belmont, Stephen Burt maps out the joys and the limits of the life he has chosen, the life that chose him, examining and reimagining parenthood, marriage, adulthood, and suburbia alongside a brace of wild or pretty alternatives: the impossible life of a girl raised by cats, the disappointed lives of would-be rock stars, and the real life to which he returns, with his family, in the town that gives the book its name, driving home in an ode-worthy silver Subaru. Can a life be invented the way a poem can? What does it mean for a precocious child, or a responsible grown-up, to depict the world we want? With wit, beauty, tenderness, and virtuosity, these poems define the precarious end of extended adolescence, and then ask what stands beyond. 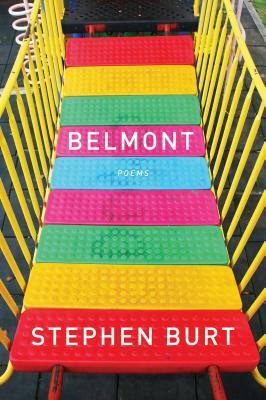 Stephen Burt is the author of three poetry collections and several critical books, including Close Calls with Nonsense, a finalist for the National Book Critics Circle Award. He teaches at Harvard University and lives in Belmont, Massachusetts. “In this, his third and best book, [Burt] is moved to song by the challenges, whimsies and ecstasies of fatherhood and suburban life. These poems are all kinds of tender; they're funny, too. Most of all, they're made wise by a father's careful attention to all his children know.” —NPR, "Best Books of 2013"
“These poems, which are often wryly humorous, express great tenderness for American domestic life. . . . They also capture the limitations and disappointments that accompany the arrival of adulthood.” —Page-Turner, the blog of the New Yorker, "Books to Watch Out for"
“Stephen Burt has long been regarded among the most important critics now writing, but this year marks his emergence as one of his generation's most interesting poets.” —NPR, "A 2013 Poetry Preview"